The eighth edition of the Conference of Parties (COP7) to WHO Framework Convention on Tobacco Control (FCTC) will be held in Switzerland's Geneva under the presidency of India. The global anti-tobacco conference is likely to be held in the later part of 2018. "India will preside the eighth edition of the Convention of Parties of WHO which will be held in Geneva," said a senior official from the Health Ministry. 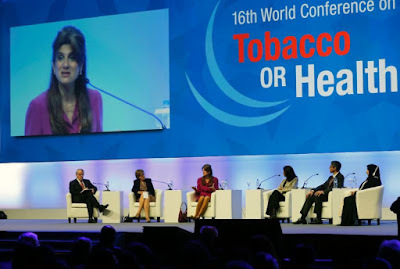 The World Health Organisations Framework Convention on Tobacco Control (FCTC) is the world's biggest convention to frame the anti-tobacco policies. 7th Session of the Conference of Parties (COP7) to World Health Organization, WHO Framework Convention on Tobacco Control (FCTC) held from 7th to 12th of this month at Greater Noida adjoining the national capital. Union Health J P Nadda will inaugurated the conference. Briefing reporters in New Delhi last evening ,Health Secretary C K Mishra said that India is fully engaged with FCTC for global cooperation in tobacco control.